Can it really be December tomorrow?! 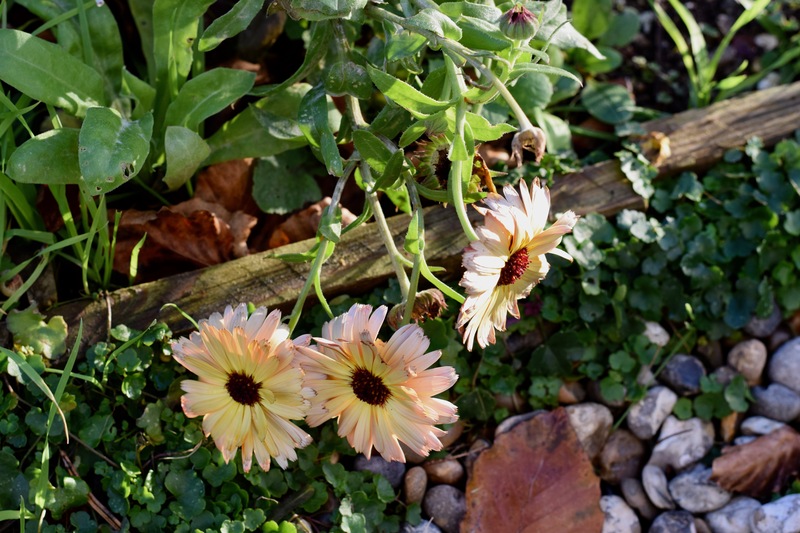 It doesn’t seem that long that I was writing about our autumnal garden at the end of October and now we’re careering headlong into winter. Not that it feels like it out there today – the temperature is in double figures and there’s a definite warmth to the sunshine which is so welcome after yesterday’s atrocious wind and rain. The rain was incredibly heavy but it topped up the pond and quenched the soil. Last weekend, we planted a little Viburnum x bodnantense ‘Dawn’ that has been hanging on in a too-small pot for about a year(..!) and the soil that came out of the hole was incredibly dry. Planting this little shrub in the gloaming on Sunday afternoon felt like a mini-achievement as I’ve been glancing at it guiltily for months and months. In the past couple of weeks, I’ve also managed to plant all the bulbs (yay) – 50 Narcissus ‘February Gold’ have been slotted into the lawn outside the window where my desk is (to cheer me up in late winter) and 50 Narcissus ‘Pheasant’s Eye’ have been tucked in among the perennials and grasses on one of the lower terraces. My birthday tulips (30 each of ‘Veronique Sanson’ and ‘Ronaldo’) have been combined in the two big pots at the front of the house for a glorious display of colour in May. There are still some anemone and ranunculus corms to plant (maybe tomorrow morning if I get a move on). 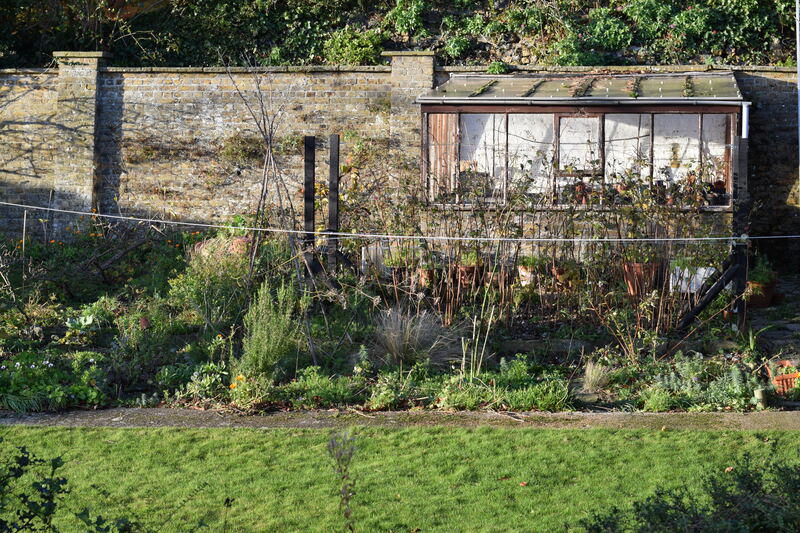 The raspberry canes (in front of the greenhouse) are almost bare now but there are a few pale raspberries hanging on. 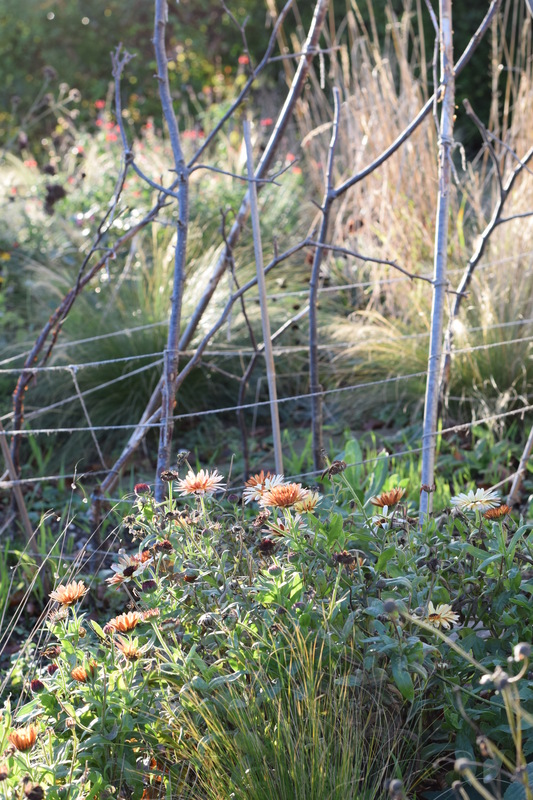 I usually leave the canes until February then cut them down to the base but have read recently that it’s ok to cut them back now. 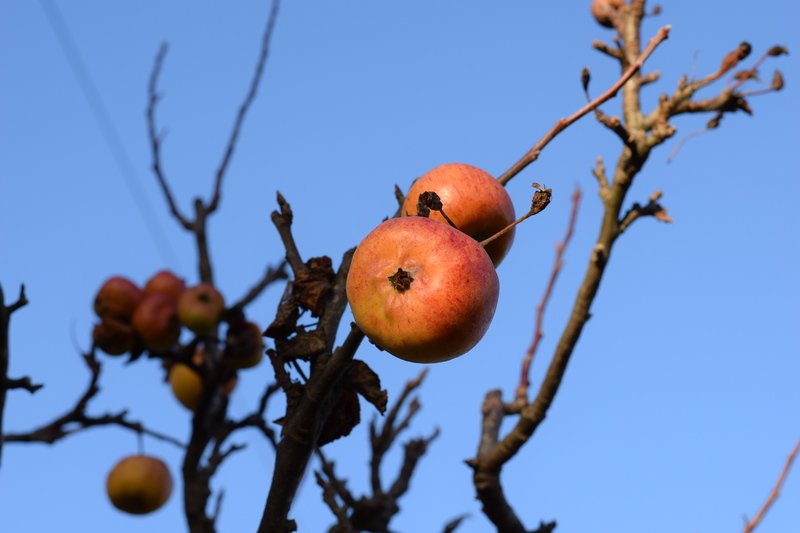 There are still quite a few small apples hanging on for grim life in the higher branches of the apple tree. I think it indicates that this variety is a good keeper but these fruits will be for the birds to enjoy rather than us. 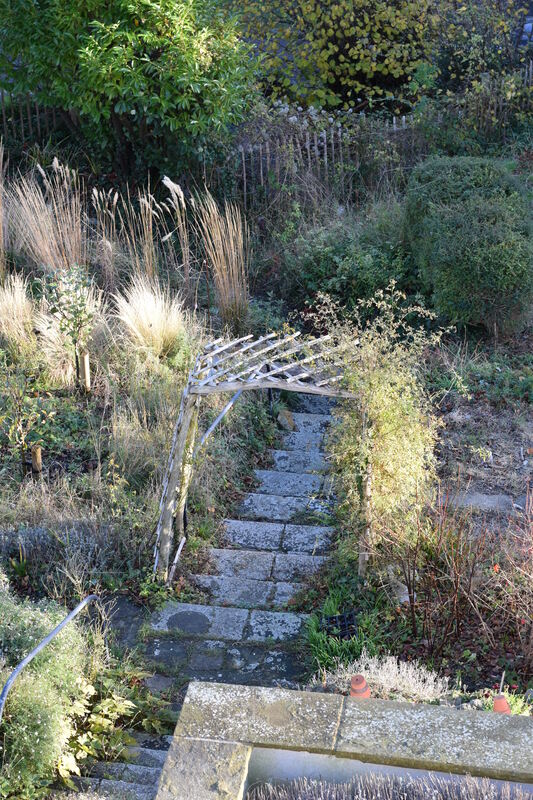 The grasses on the lower terrace are at their best right now – bleached and eye-catching, they weave the garden together and add real interest (to my eye). 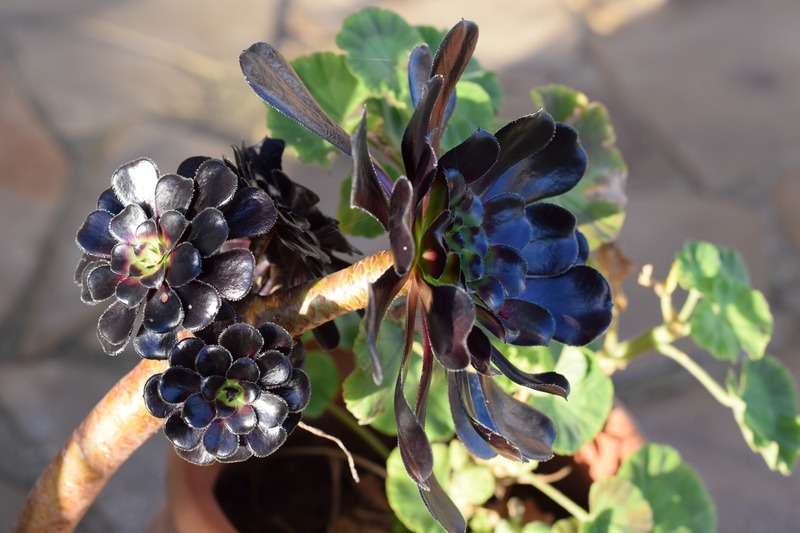 I love how the winter sun catches them. 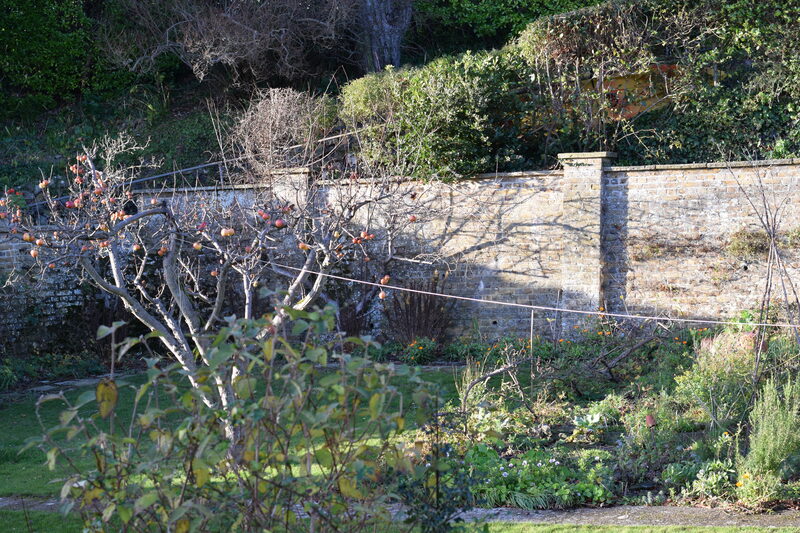 The rickety arch over the path is being held up by a climbing rose on one side and a jasmine on the other. I must move this aeonium to a more sheltered spot. Marigolds ‘Sunset Buff’ still going strong, bare twiggy sweet pea supports and grasses. 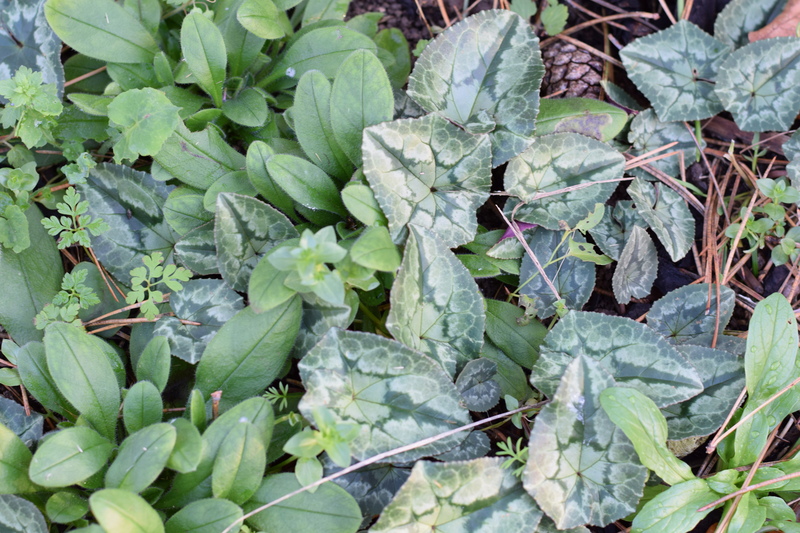 More forget-me-not seedlings and cyclamen leaves (and assorted weeds). 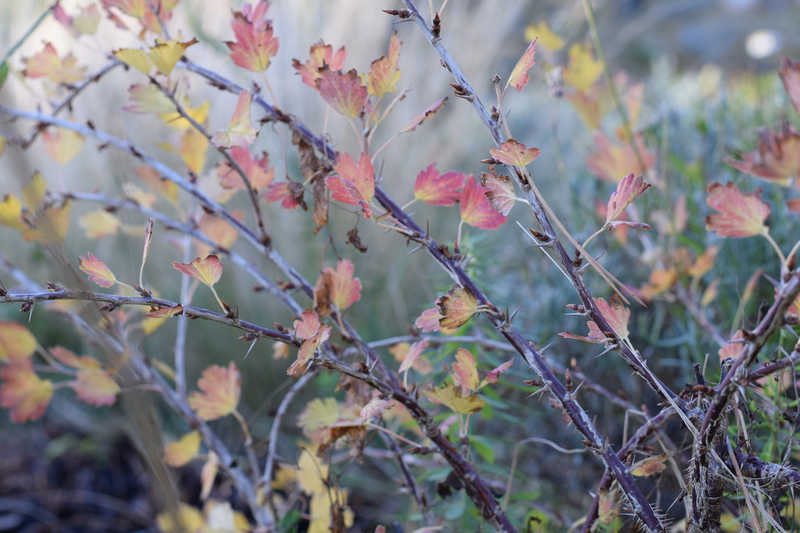 Gooseberry branches – soon all the leaves will drop to leave the spiny bare stems. 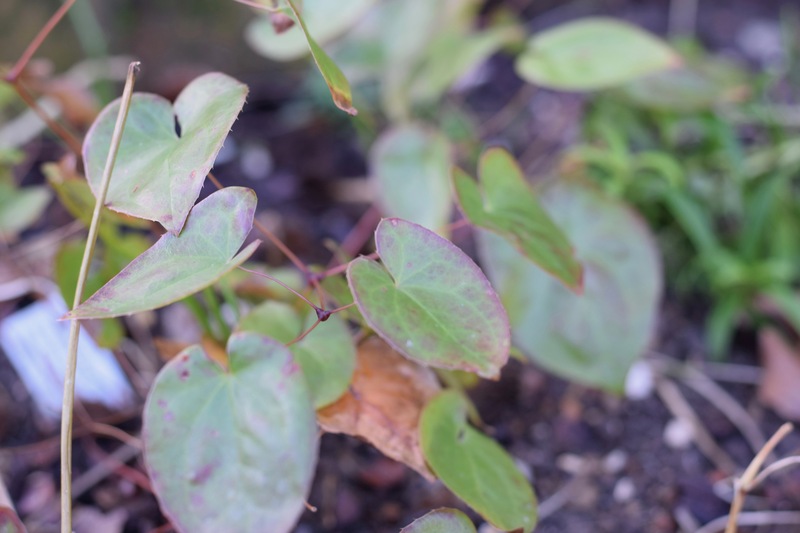 I pulled out a load of nasturtiums the other week and found this lovely Epimedium (can’t remember the species, must check the label!) which I planted in spring. It’s survived happily under its leafy blanket. 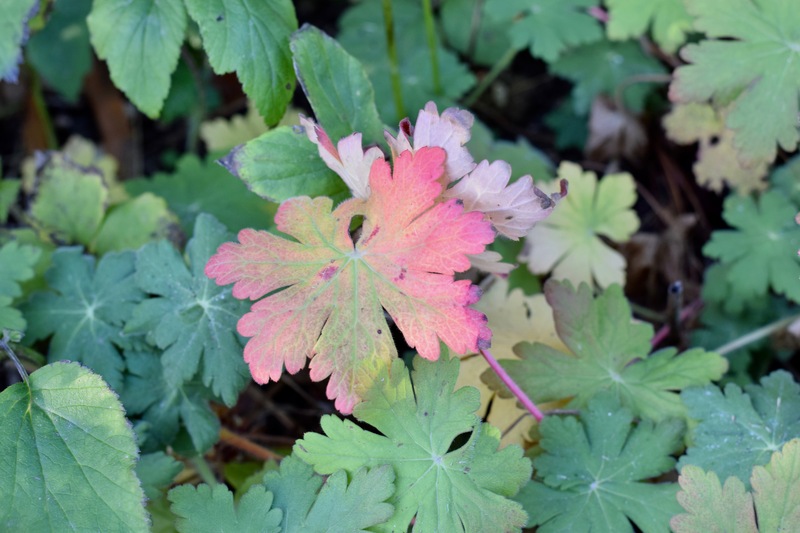 I love the colour of fading hardy geranium leaves. A big pot of tulips tucked up for the winter. 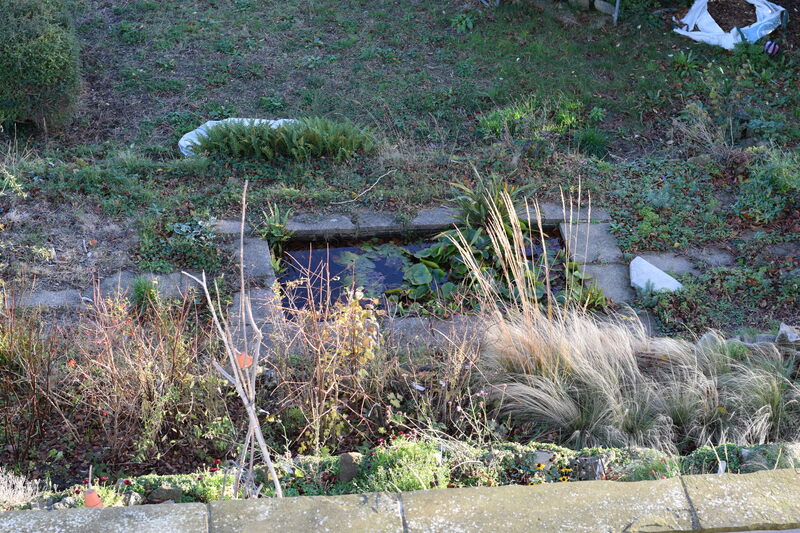 So, there’s our garden at the end of November. As the festive season looms and the days become shorter, getting out there to see what’s going on is harder but always rewarding, even in the depths of winter. I hope you’ll come. back next month to see how the garden is looking at the end of the year. Thanks for visiting and bye for now. Hello, there! 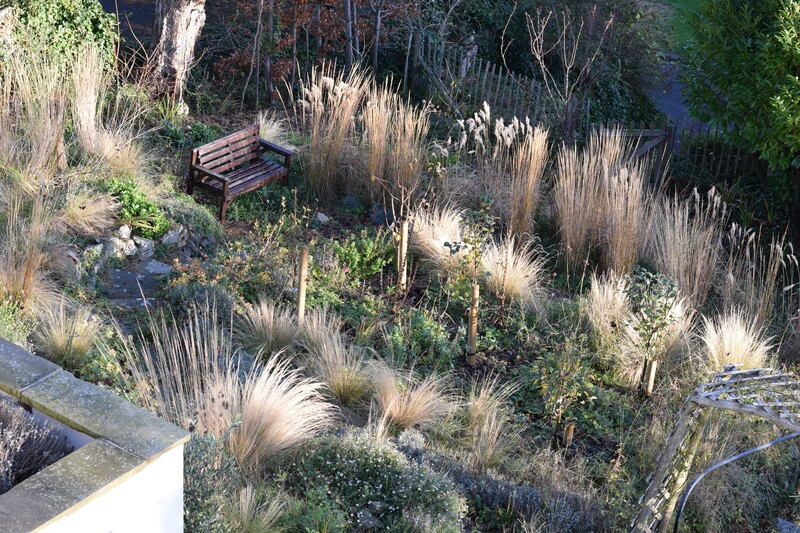 I’ve just come from the Patient Gardener, and I just wanted to say that I love that terrace area with all the grasses. 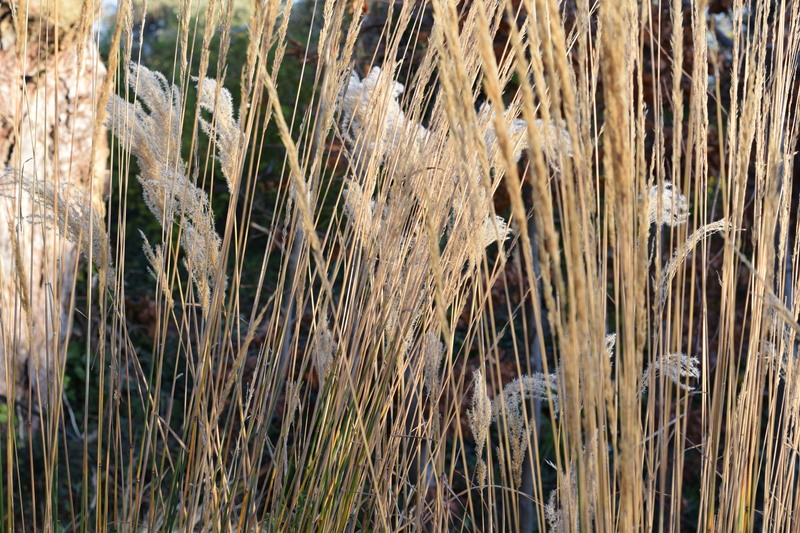 Here in central Spain, we have lots of native grasses (mainly stipas), and I am considering working more of them into my garden, but I have never tried moving or dividing them. Have you? Your gooseberries look just like ours. Are they native or were they planted for berry production. They were planted for the fruit but the birds got to it before we did this year! Gooseberries are uncommon here. There are a few natives on one of my vacant parcels, but they only make a few berries, and the birds get them first. 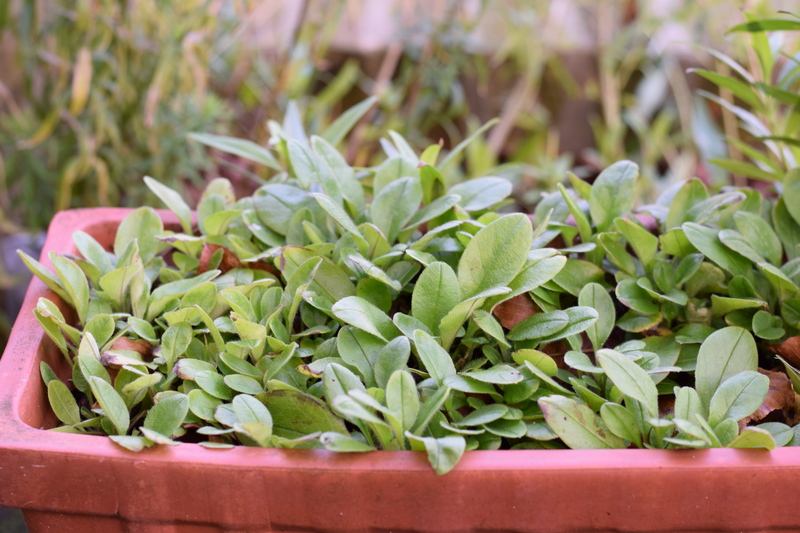 I intend to eventually plant some garden variety plants. Good for you getting your bulbs planted – and the Viburnum. 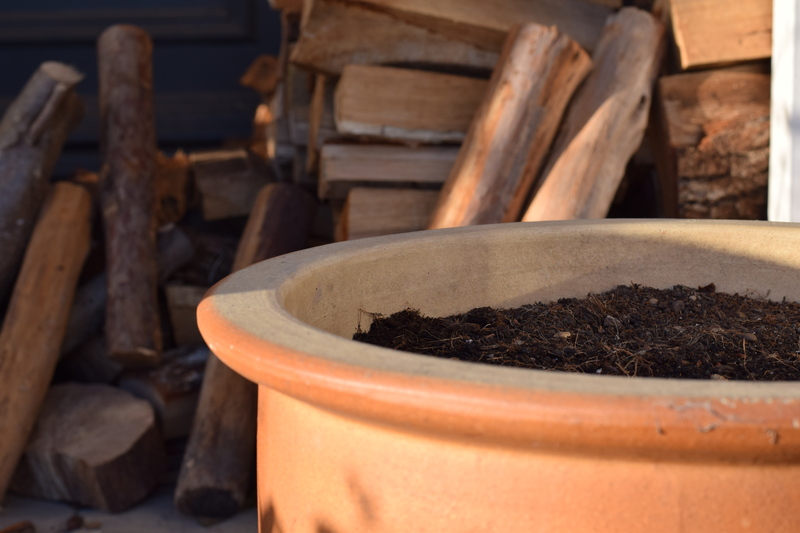 Do you leave your Tulip pots outdoors? Yes but they’re right outside the door and we have a dog to bark at squirrels! Hopefully they’ll be fine. Also grateful for rain last night, in our tanks, and our pond. Ooh, now I want a lovely romantic arch, sweeping grasses, a pretty pond and a promising pot of tulips…must write letter to Santa. It all looks great, Sam, and your hard work really shows.